Naturally inspired and passionately designed, the Samsung Mini Notebook N310 captivates your imagination with minimalist design and ultra-tactual feel. Delivering all day connectivity, performance and style, for anyone who wants to stand out from the crowd. 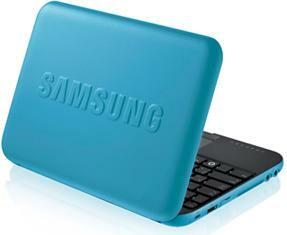 The Samsung Mini Notebook N310, have everything you need and nothing you don't. Unites the best in innovative style and technology with a unique design by leading Japanese designer, Naoto Fukazawa. The warm and cute styling and tactile, soft shape make a unique lifestyle statement with its friendly and casual-looking image? Perfect for the style conscious consumer who likes to make a good impression. A robust and ergonomic design built to the highest quality standards. Its durable casing and premium styling provide amazing strength and superior reliability as well as an outstanding look and feel, with exceptional haptics, for a more enjoyable and productive experience wherever you go. Delivers longer battery powered performance of up to 5 hours*, independent of any power supply, for maximum freedom and mobility. This vastly improved battery life is guaranteed by the LED display and optimised processing performance coupled with Samsung's class leading engineering. So you're always ready to go anywhere and do anythin. Experience optimum mobility with an ultra compact 10.1" design, weighing just 1.23Kg (with a 4 cell battery), so you can carry less, but do more. Despite being one of the lightest in its class and small enough to carry in a handbag, briefcase or luggage, it still incorporates comprehensive functionality for maximum performance on the move. Sleek and seamless design with a frameless and scratch-proof flat screen for a premium lifestyle experience. The robust and minimalist layout, which is accentuated by a pebble design keyboard, is more than capable of withstanding everyday bumps and knocks and the inevitable hardships of life on the move. Provides comprehensive connectivity using a variety of advanced wireless technologies, including HSPA**, WiMAX** and WiBRO**, enabling rapid access to the Internet and your data anytime and anywhere. It also includes an internal microphone and headphone-out connection, so you can easily stay in touch using VoIP telephony when you're on the go. Makes typing easier with a normal-size, pebble design notebook PC style keyboard that is 93% the size of a desktop keyboard. Despite a small form factor, its ergonomic design and optimised 17.6mm key spacing provide a more pleasurable and productive experience, with less strain on your wrists, fewer errors and faster typing speeds.